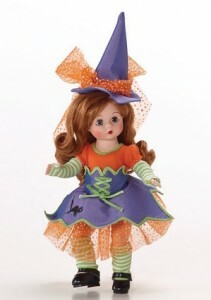 We look forward to Halloween at WCN every year and we always love the Madame Alexander editions. This years 8″ Wendy editions include the spectacular Dia De Los Muertos and two versions of the very cute I’ll Put A Spell On Boo! dressed in Halloween purple and orange. 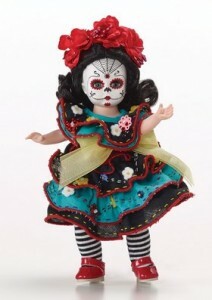 Madame Alexander Dia De Los Muertos – This 8’’ fully articulated Wendy doll is dressed to celebrate Dia de los Muertos also known as Mexico’s Day of the Dead. In 2015 this special day begins on November 1st, the day after our own Halloween! She has blue eyes and black hair. Her hair is curly and shoulder length wig with a red flower crown. Her dress is a mixture of red/white taffeta with black and teal cotton. Her dress is beautifully accented with red and blue holographic flowers. Her red Mary Jane shoes complete her perfect outfit. I’ll Put A Spell On Boo! – This 8″ fully articulated Wendy is dressed as a witch. She is has long hair with the perfect curls and bangs. She is wearing a cone shaped purple and orange hat. 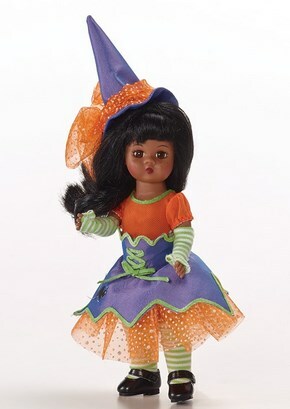 Her dress has green with purple taffeta and orange white sparkle dot tulle underneath the skirt. I’ll Put A Spell On Boo!